Despite various reports to the contrary, coming out of India, the fact remains that by 2020, India will be the most populated country in the world, exceeding even China. None of India's famous tiger parks, Ranthambore, Kanha, Bandhavgarth, James Corbett, Sariska, Panna etc. are fenced. Nowhere has the Indian Government been able or willing to reduce the conflict between human beings, domestic stock and tigers. 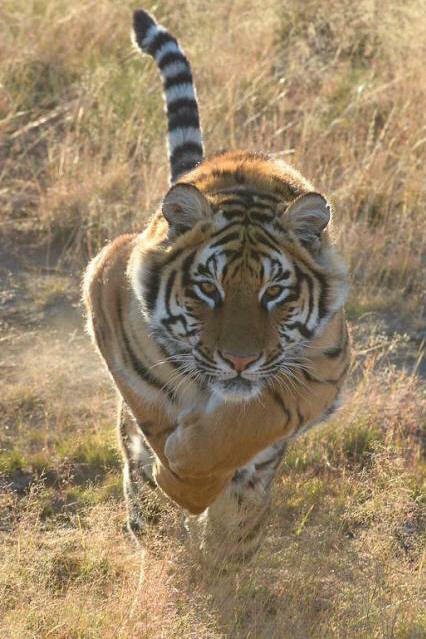 The sad fact is that Asia continues to lose a tiger per day to poaching (the body parts industry in China is expanding annually), illegal hunting, loss of prey and loss of habitat. Therefore it is with great pleasure that I can announce that a valuable piece of land in close proximity to Tiger Canyons has been purchased for tigers. The land has exceptional underground water and can be converted into a highly productive wetland. The farm house can easily be changed into a lodge, resulting in the daily travel to Philippolis to be discontinued. A runway suitable for executive jets is to be constructed in close proximity to the lodge. In time, a "game guides academy" is to be created out of the nearby stables. Courses in guiding, tracking, photography, filmmaking, land management and veterinary skills will be offered. Our objective will be preparing young people for a career in the tourist industry. Our motto is "Tigers bring Tourists, Tourists Create Jobs"
It is our desire that the poverty pocket of Philippolis will greatly benefit from the job creation, training and upliftment that this project will bring. We intend to become a major player in the reclaiming of the land back to its original state and also in the creation of wealth through tourism. I would like to thank sincerely Emma Wypkema and Jabu Mabuza for their vision, faith and resolve in investing in this bold project. I would also like to thank Bill and Ansie Schoeman for selling us this magnificent property. It is with great pleasure that I can announce that two luxury beds are being developed on the canyon. In addition, a downloading facility and dining room is being constructed so you can download your pictures while having breakfast. Toilets are being constructed, so that you can go straight from your game drive to breakfast. I would like to thank Margaret Pang (Margaret also sponsored Ussuri's three cubs Antoine, Jamez and Marguerite) for financing this valuable addition to Tiger Canyons. The Tigress Julie Foundation is almost complete. It has been registered as a company for non profit. I would like to thank Werner de Jager for his advice and help in establishing the Tigress Julie Foundation. The Tigress Julie Foundation can accept donations from anywhere in the world in any currency. At the discretion of the trustees, the money will be spend on any tiger project which attempts to help save the endangered tiger. I would like to thank sincerely the following who have agreed to be directors of the company. Financial details of where you can donate will follow shortly. "The tiger will not be saved by one individual. It will be saved by a team of like-minded people prepared to share their financial resources, creativity and talent"